Here is an original guide / brochure for the Rolleiflex 3.5 and 2.8 TLR cameras. This explains all of the cameras functions and on the back it lists all the accessories available with prices. 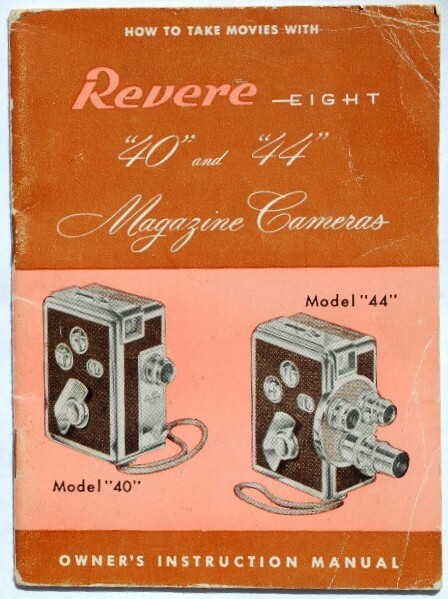 There are some color photographs and great illustrations of the cameras and well as explanations about each function. The physical condition of the book is used with no writing. The manual is not held together well, most pages are only connected at the top. There are a total of 18 pages. The actual manual is pictured here so you can see exactly what you will get. 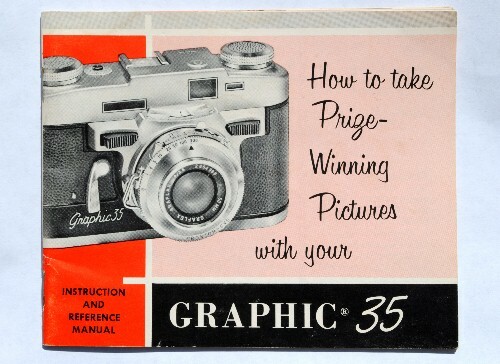 Original Guide Manual Book for the 1960's Nikon F 35mm Camera CLEAN! Here is an original guide / manual / book for the Nikon F 35mm Camera, the automatic 35mm reflex camera - a total system of photography. It is probably from the late 1960's or maybe a little earlier or later? I'm not really sure but I know it is quite old and very clean. 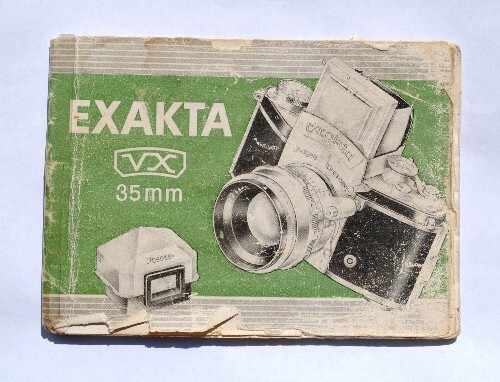 The physical condition of the book is used with a stamp from The General Camera Co. on the back cover. There are a total of 23 pages. The actual manual is pictured here so you can see exactly what you will get. Here is a very nice original guide / manual for Pentax 35mm camera lenses and accessories called - A Complete System of Photography. This is most likely from the late 1970's to early 1980's and covers the manual focus SMC lenses of the time. The physical condition of the book is new with minimal discoloring and small stains on front and back covers. The back cover is slightly bent at the top. There are a total of 51 pages. The actual manual is pictured here so you can see exactly what you will get. 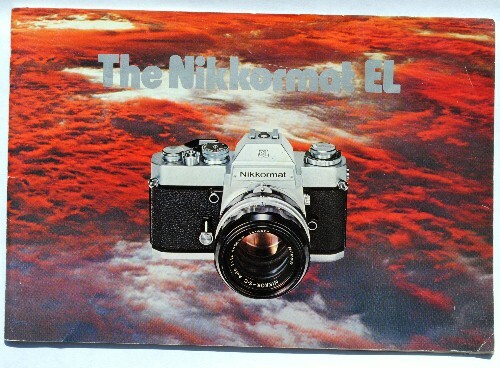 Here is a very nice original instruction manual for the Nikkormat EL Camera. The physical condition of the book is used, but in excellent condition. There is slight wear on the edges as well as a few small bends on front and back covers. There are a total of 41 pages. The actual manual is pictured here so you can see exactly what you will get. 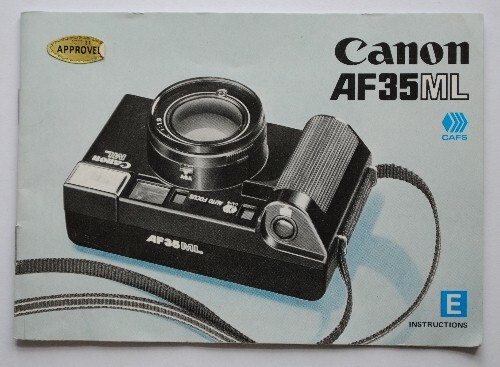 Here is a very nice original instruction manual for Canon AF35 ML Camera. The physical condition of the book is used, but in excellent condition. There is no writing or underlining and is bound well. The edges of the manual are slightly worn. There is a gold "approved" sticker on the front cover. There are a total of 25 pages. The actual manual is pictured here so you can see exactly what you will get. 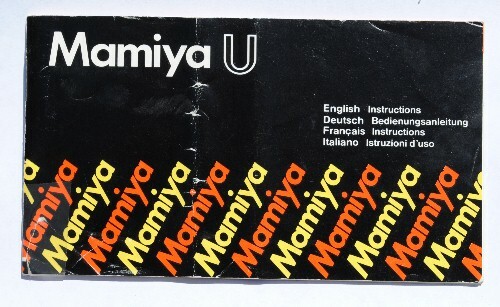 Here is a very nice original instruction manual for the Mamiya U film Camera. The physical condition of the book is used with slight warping and a slight bend in the center. Instructions in four languages: English, Dutch, French, and Italian. There are a total of 26 pages. The actual manual is pictured here so you can see exactly what you will get. 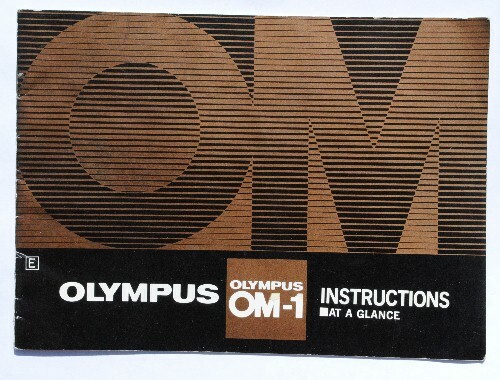 Here is an original instruction manual for the Olympus OM-1 35mm film camera. The physical condition of the book is used with some handwriting on the first page. There are a total of 14 pages. The actual manual is pictured here so you can see exactly what you will get. 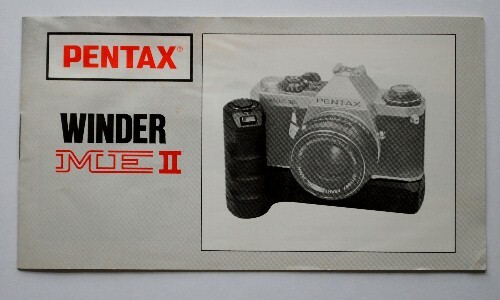 Here is a very nice original instruction manual for Pentax Winder MEII. The physical condition of the book is used with what looks like water damage is the top left corner of the book. There is no writing or underlining. The pages are in good condition and the supposed water damage just left a slight stain, but the pages are not stuck together and everything is readable. There are a total of 15 pages. The actual manual is pictured here so you can see exactly what you will get. 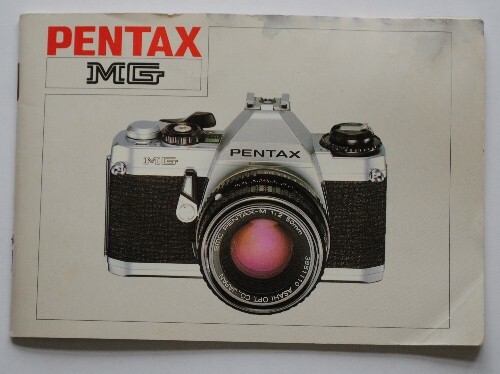 Here is an original instruction manual for the Pentax MG 35mm film camera. The physical condition of the book is used. There is no writing or underling, but there is water damage to the top right half of the manual. Due to the water damage, there is discoloring and staining. All the pages are readable and pages are not stuck together. The cover and the first page have been dog-eared on the bottom right corner. There are a total of 49 pages. The actual manual is pictured here so you can see exactly what you will get. 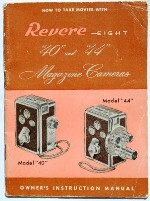 Here is a very nice original instruction manual for the vintage Revere Eight "40" and "44" Magazine 8mm movie cameras. The physical condition of the book is used with very little wear. The corners of the manual are worn and there are a few creases on covers. There are a total of 25 pages. The actual manual is pictured here so you can see exactly what you will get. 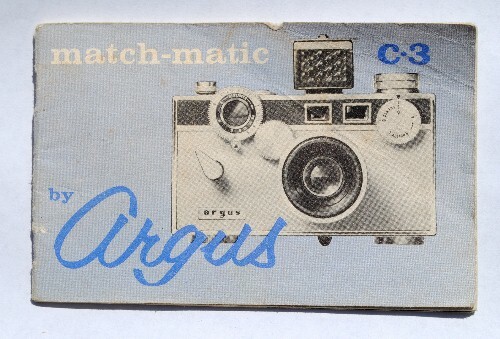 Here is an original instruction manual for the Argus Match-Matic C3 vintage camera also known as The Brock. Lots and lots of these came back to America with soldiers coming home from the war. It is one of the most popular cameras ever made and they still take great pictures! The physical condition of the book is used with no writing and excellent binding. There is wear from age and use. The front cover bent. There are a total of 22 pages. The actual manual is pictured here so you can see exactly what you will get.